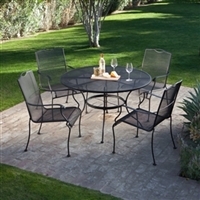 Is your patio area bare and barren, you can turn it into an oasis with the right outdoor patio dining set? Build a place that family and friends will enjoy getting together to have a meal, or just hang out. 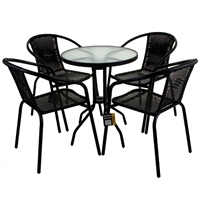 You have different kinds of outdoor patio dining sets to choose from. Sophisticated a metal frame table with a glass top has a refined look about it, and some come with plush swivel chair for the head and foot of the table. 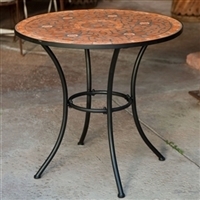 For traditional look try a ornate metalwork, or modern a round glass dining table set. Rustic a wooden farm-style table and bench for a country feel. 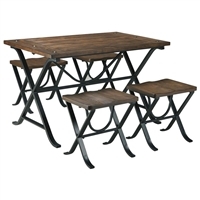 And wicker patio dining sets have a rustic feel. Artsy if you have a stone patio area a mosaic or tiled outdoor dining set has a creative style. Coastal for an island feel try a light and airy colors for your dining set. Choose a set that will not overwhelm your patio area. In warmer climates try a sturdy metal or wood set that can stay out year round. For cooler climates try an aluminum set that is lightweight and easier to move and store. If you add an umbrella to your outdoor patio dining set will help keep the sun at bay a extend your time on your patio. From large 7 piece dining sets to 2 person bistro sets whatever you choose will help get the outdoor living area you need to get some rest and relaxation after a long day or to enjoy the great outdoors.